This digital billboard on Cahuenga Blvd. in Hollywood was the target of demonstrations by people living in nearby houses and apartments. Digital billboards with their brightly-lit, rapidly changing ads for movies, fast food, cars and other products have been the subject of numerous, bitter complaints ever since they started going up without public notice in select L.A. communities five years ago. But now the City Council’s thirst for new revenue has led it to contemplate allowing more of the signs that have aroused the complaints about visual blight, light trespass into homes and apartments, and potential traffic hazards. A motion by Councilman Ed Reyes would set up a working group to develop legislation and agreements to allow new digital billboards and legalize the 100 existing digital billboards that have been in legal limbo ever since a Superior Court judge ruled in 2009 that the city had circumvented required public process when it cut a closed-door deal with Clear Channel and CBS Outdoor that allowed the companies to convert more than 800 of their conventional billboards to digital. 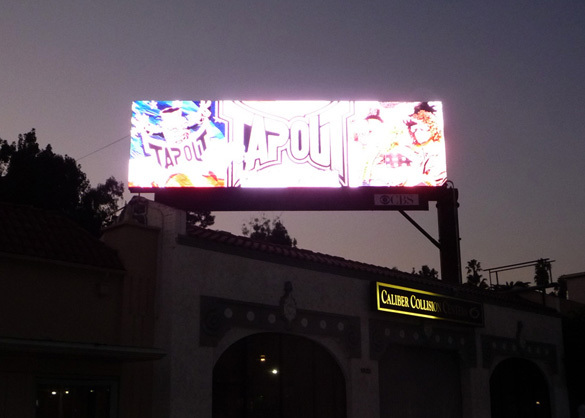 That ruling, in a lawsuit brought by a small billboard company that wasn’t a party to the deal, has been appealed to the California Appeals Court. Oral arguments are scheduled for Oct. 30 in L.A. and a ruling could come late this year or early next year. The Reyes motion, seconded by Councilmen Paul Krekorian and Tony Cardenas, follows on the heels of many months of lobbying by the billboard companies to put together a deal involving revenue sharing with the city and a settlement of the lawsuit brought by Summit Media before the Appeals Court issues a possibly adverse ruling. The motion is scheduled for a City Council vote on Tuesday, Oct. 16. The motion calls for the city Planning Dept. and the office of the Chief Legislative Analyst to set up a “working group” that would draft legislation to provide “public benefits” in connection with digital signs and reduce the overall number of signs in the city. The working group would also draft agreements that would resolve the legal issues and “potential liabilities” to the city as they pertain to the Summit Media lawsuit. As to the composition of the working group, the motion only states that sign companies would be included. No mention is made of community representatives or other members of the public involved in signage issues. To read the entire text of the motion, click here.